Slit eggplants by making two cuts lengthwise,at right angle to each other, leaving stem intact. Dry roast coriander seeds, sesame seeds, peanuts, Poppy seeds and shredded coconut separately and coarsely grind to make coarse paste. Add crushed garlic, chopped coriander, salt, turmeric, garam masala, pinch of soda, Poppy seeds and 2 Tbsp of oil. Mix and loosely stuff it in slit made earlier in eggplants. Add jeggery and tamarind pulp to the left over stuffing along with little water to make thick sauce. Keep aside for later use. Now in a heavy bottom pan heat 4 Tbsp oil and when at right temperature add fenugreek, asafetida and curry leaves. 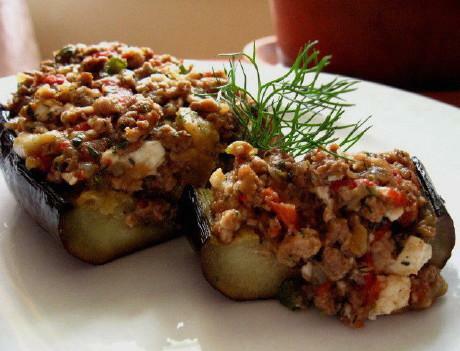 Fry for few seconds and add stuffed eggplants. Reduce heat to low, cover pan with thali and put some water in thali so as to cook eggplant with their own steam. Add little water if bottom dry and starts to stick. Cook on low heat until eggplants tender. Stir or rearrange eggplants by tossing whole pan rather than using spoon. When eggplants are tender pour jeggery tamarind mixture over eggplants and cook for few more minutes. Serve hot with Roti, Paratha , nan or rice. Thin-slice the karela into rings. Do not discard the seeds unless they are hard or discolored. It is believed that every part of a plant has some nutritional value and that skins, peels, seeds (soft) should not be discarded. Therefore the karela is not soaked in salt water and then squeezed to reduce its bitter taste.